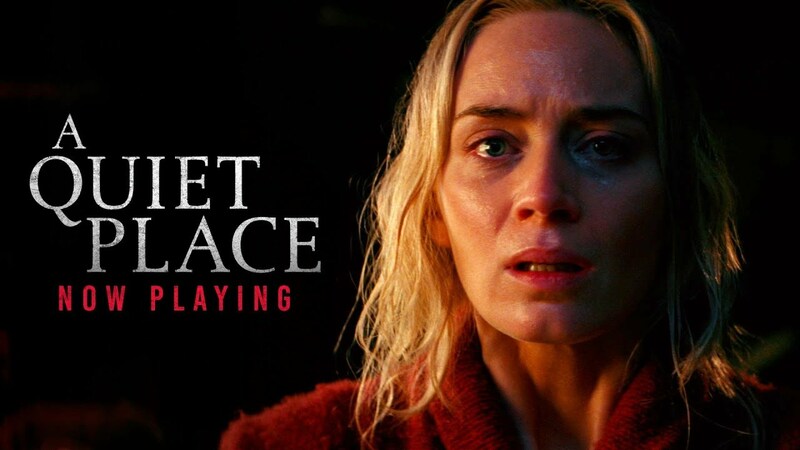 The Lantern reviews new, almost completely silent, horror film, A Quiet Place. Movie theater popcorn is the best! However, A Quiet Place does not leave room for snacking, munching, drinking, talking, or loud breathing. Using sign language for 95% of the dialogue, this unique film was indeed quiet. Footsteps were muffled and noises made by the characters were cautious because of creatures that would attack and kill anyone that made too loud of an unnatural sound. Surviving this far throughout the invasion, one family in particular seemed experienced and cautious. Markings on the ground symbolized safe places to step and sand was laid out in paths around their property to show safe places to walk while also dampening their footsteps. While these features of adapting to their new situation were revealed at the beginning, others involving the family were unveiled soon after. The oldest daughter was not only deaf, but she blamed herself for her brothers death. At first, I felt bad and could see where she was coming from, but as the movie progressed, she started to irritate me. She was too defiant, angry, and rebellious even though the family was just trying to survive. Looking past this irrational character portrayal, the mother was inconveniently pregnant and everything seemed to go downhill as they neared her due date. Towards the middle of the movie, situations and events kept going wrong and although this was an attempt for suspense, it was a little much at times. The family had been living in silence for over a year and seemed to be experts, so having literally everything go wrong within one day wasn’t plausible. Although the movie was a little quiet for my liking, there were some nice contrasts to the lack of sound. For instance, when the creatures would attack, noise would suddenly blast through the speakers to a point where it was almost deafening. This also gave room for some good old-fashioned jumpscares because the silence would be broken by seemingly deafening noises. As the movie neared the end, the action picked up and things finally started to get really interesting and suspenseful. But, the conclusion was a bit of a let down. Caden Bell agrees stating that, “The ending was too happy for what the movie was about. It was set up to be all intense and kinda sad but ended up being really corny. The ending was definitely the low point”. It seemed like the directors didn’t have any other direction to go with the story so they ended the film and it was very abrupt and disappointing. While it was interesting to see this unique film, one showing was enough for me. In terms of seeing something different and suspenseful, I would definitely recommend this movie, however, this film was a little slow to follow. Jumpscares were sprinkled throughout the film but I personally thought it wasn’t enough to make the movie unbearably frightening. Plus, I’d rather be able to freely make comments and enjoy my popcorn throughout the film instead of having to remain silent because it was way too quiet of a place for me.